The Toronto Linkage to Care project employs a designated coordinator to provide support to people newly diagnosed with HIV in settings where there is not a direct link to ongoing care. 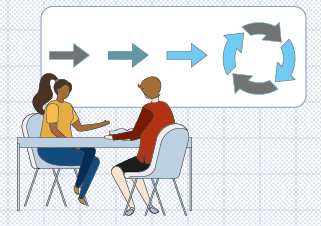 The Linkage to Care coordinator works collaboratively with healthcare providers to develop pathways for referring their newly diagnosed patients to receive short-term case management and support to connect with HIV care, treatment and related supports. The Linkage to Care coordinator also works collaboratively with community based organizations and healthcare providers to develop new programs that improve access to HIV care and treatment. The project was developed in partnership by the Ontario HIV Treatment Network, Toronto Public Health and Hassle Free Clinic. One-on-one counselling and short-term case management services, including home or community visits, appointment accompaniment, and transportation support. Facilitated referrals to infectious disease specialists and/or HIV-knowledgeable primary care physicians, pharmacies, and medication compassionate care programs through our network. To refer someone or find out more about the program, please leave a voicemail for Simran Kaur, Toronto Linkage to Care Coordinator, at 416-642-6486 ext. 2213 or email skaur@ohtn.on.ca.